© Shashwath MM Shashwath is an installation artist who specialises in site-specific work. He often repurposes found objects, creating narratives that allow them to be seen from new perspectives. More recently he has been exploring wood and resin in his sculptures, though tape remains one of his favourite materials. He has a Bachelors in Communications, a post-graduate Diploma in Art & Design and has completed his Masters in Contemporary Art Practice. Among others, Shashwath has displayed work at the Kochi-Muziris Biennale Collateral, Kochi, C.E.M.A Gallery and Venkatappa Art Gallery, Bangalore. During his time as artist-in-residence at Zentralwerk in Dresden as part of the Goethe-Institut / Max Mueller Bhavan’s bangaloREsidency-Expanded, Shashwath plans to conduct Open Studio sessions and create explorations around resin, epoxy and glass. 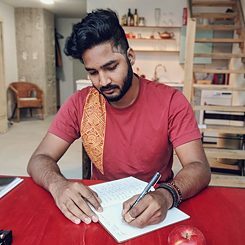 He is also making artworks with tape and hosting workshops around creating empathy, inclusiveness and earnestness for art in the social media space. © Shashwath MM "I have spent 2 complete winters in Europe and inspired by a line spoken by George Bailey from the 1946 movie, “It’s a Wonderful Life”, where he asks Mary whether she wanted him to give her the moon, I decided that I needed to make myself a moon. One that people could hold in their hands. It would be our triumph over the winter. A token they could hold on to till summertime came. I worked with Roswitha Maul, a member of Zentralwerk and an artist specialising in resin and epoxy, to build a moon using acrylic glass. The show was titled ‘On Winter’. It was my dedication to the German wintertime. During my stay in Dresden, we celebrated Diwali and I decided to make a Rangoli as a marker of the first day of winter. Out of nowhere, Louisa, an art restoration expert who worked out of Zentralwerk, offered me old pigments she didn’t need. Later, she told me they belonged to her grandmother, and were more than 40 years old. Rangolis symbolise an invitation to God, to come and bless the space, something I wished for my first solo exhibition. It was also important for me to represent part of my identity as an Indian national in the show, I felt that without it, the cultural exchange would be incomplete. The third piece of the show is a photo-series that I had been ruminating on for just over a year. I wanted to emphasise the importance of the window as a sort of doorway into the life of someone. I placed this final photo series on the wall of the room opposite to the only windowed wall of the room. When you look towards the right, you would look outside through the window, but when you look to the left, you looked inward through a window. The moon lay resting on the sill of the windowed wall to the right, as if it fell out of the sky and was there for anyone to pick up. ‘On Winter' was a 2-day exhibition in The Cabinet at Zentralwerk on the 1st & 2nd December, 2018.